Console commands are given to a wallet that is already running. Startup commands are used when starting up a wallet. 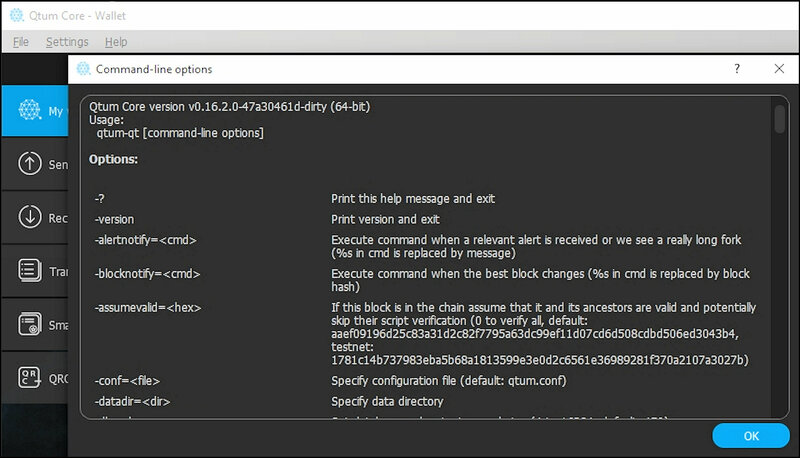 This manual focuses on the console commands which are given to a wallet that is running and can be sent using RPC (Remote Procedure Calls) or on the command line to the qtumd server wallet or given to the qtum-qt desktop GUI (Graphical User Interface) wallet using the Debug window Console command line (see Figure 1). Note the warning message in red in Figure 1 and be careful using the private key commands (dumpprivkey and dumpwallet) with Mainnet wallets. 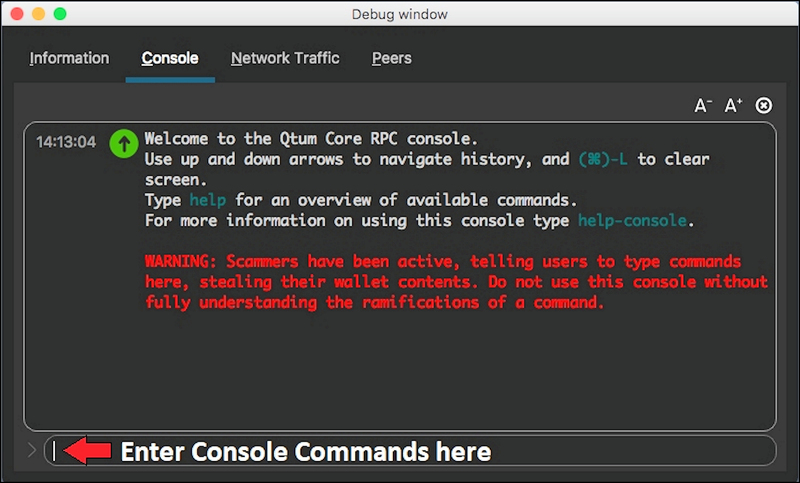 For the server wallet qtumd, console commands are given using the Command Line Interface application qtum-cli on the system command line prompt (see Figure 2). 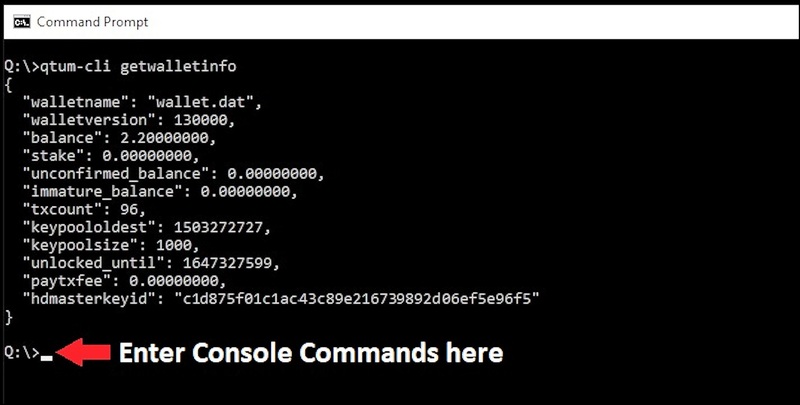 Console commands are given to a running Qtum Core wallet and provide additional information and control. Console commands and are required to operate the qtumd server wallet, which is a "headless" wallet with no graphical user interface. There are 136 console commands with some good references for the 112 inherited from bitcoin. There are 13 "hidden" commands that are used by developers and wonít show up in the "help" list. 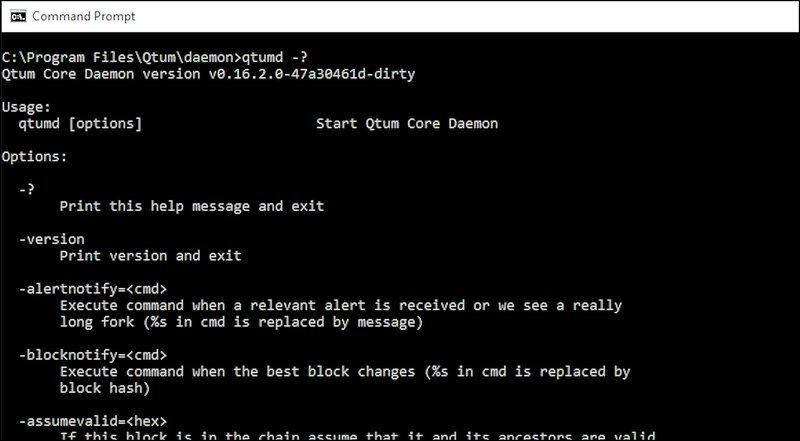 Common parameters for these commands are Qtum addresses, block hashes, contract addresses, etc. Some of the commands will have an optional parameter "minconf" (minimum confirmations) which allows you to get a response for a transaction or block that has at least that number of confirmations. The chain query bitcoin API reference http://chainquery.com/bitcoin-api explains the parameters and gives examples with responses for the commands inherited from bitcoin. The bitcoin chain query API reverence gives 67 commands, of which 2 are not in Qtum (estimatepriority, getgenerate) and two (gettransaction, walletpassphrase) have an additional parameter for Qtum. See also https://bitcoin.org/en/developer-reference#remote-procedure-calls-rpcs. Advanced interfaces to the Qtum Core wallet (full node) can use these "console commands" as RPCs (Remote Procedure Calls) over a dedicated port connection to the node. To build an exchange hot wallet or server node for a mobile DAPP (Distributed Application) you can use RPCs, which follow these same console commands. The client node offers a JSON-RPC interface over HTTP sockets to perform various operational functions and to manage the local node. A quick comment on "accounts". Accounts was an ill-fated way from bitcoin to track balances for what are really UTXO transaction-based values, and "accounts" are deprecated and will be phased out by version 0.18. Startup commands give additional control and recovery options when launching the wallet. For example, you can use startup commands for various kinds of blockchain recovery techniques, additional debug logging or additional controls. If you are going to use these startup commands, make sure you have a good backup of the wallet.dat file. For these console commands documented below, responses are given for default parameters (Qtum version 0.16 ñ winter 2018/2019). Commands marked DEPRECATED should not be used because they will be removed and replaced in future versions of the wallet, for example, commands using "account" will be removed in version 0.18. Using the command "help \" will give complete information about the command and relevant parameters, formatted in a way you can copy and paste (replacing the addresses, transactions IDs, etc., as required). The format below shows the command with parameters followed by the response, in some cases, parameters or responses are truncated with the term "\". 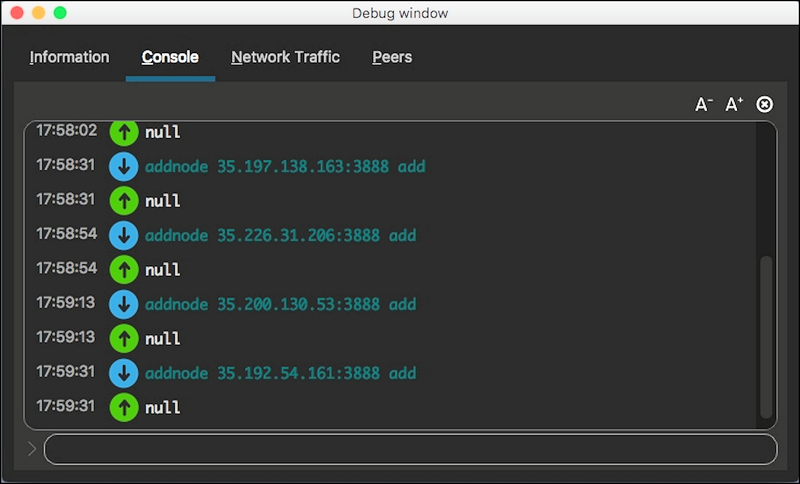 Where noted, some commands only work with the regtest (Regression Test) network. Many commands will return "null" for qtum-qt and return nothing for command line systems. Works on transactions not in the blockchain or mempool, used in testing. Stops a wallet rescan triggered by a command such as importprivkey. This command can be issued by opening a 2nd command line window (where the first window is scanning), in which case the command will stop the scan and return "true". Add a multisignature address to the wallet so you can receive and send from that address. Run the command on each machine that will be signing and backup the wallet.dat file. The address can be a Qtum address or hex-encoded public key. Use importaddress to add the multisig address on each signing wallet. This functionality is only intended for use with non-watchonly addresses. See importaddress for watchonly p2sh address support. Use of account is DEPRECATED). See also validateaddress. Qtum-qt returns "null" after each (see Figure 6). Hidden command. DEPRECATED. This command was a way to generate a SegWit address from an existing legacy address, usually a P2SH-P2WPKH addresses - Pay-to-Witness-Public-Key-Hash (P2WPKH) script embedded in a Pay-to-Script-Hash (P2SH) address. This command is mostly disabled in version 0.16 and will be removed in version 0.17. Instead, use the getnewaddress command with address type "p2sh-segwit" or "bech32". Bumps the fee of a transaction, replacing it with a new transaction by adjusting the change. The new fee can be calculated automatically or by using various options. Clear all banned nodes IPs. Qtum-qt returns "null", qtumd gives no response. Publish a smart contract for the given bytecode, using default gas price of 0.00000040 and gas amount of 2,500,000. Returns the transaction ID and the contract address hash. Create a hex-encoded raw transaction sending some inputs to outputs. The transaction must then be signed and sent to the network, see signrawtransaction and sendrawtransaction. Returns a hex-encoded raw transaction. If you are sending coins make sure to create a change address so the change can be returned; any difference between the input values and output values will be taken as the transaction fee. If you donít work out the math you could pay a big transaction fee. Gives the decoded data from a raw hex-encoded transaction. Here we decode the results from createrawtransaction above. Disconnects a peer (node) using either the IP address or node number. Qtum-qt will return "null", qtumd will return nothing. Displays the private key for a given address in WIF (Wallet Import Format). The wallet must be unlocked (and not for "staking only") for this command to work. Writes all the wallet private keys to a file in clear text (unencrypted) format. The wallet must be fully decrypted (not just for staking only) for this command to work. Returns the filename. Dumpwallet will save all the private keys and their addresses; it will not save watchonly addresses (which do not have private keys in the wallet). This file contains all the private keys in the wallet (1,000 or more), be very careful and do not store the dump file online. Encrypts the wallet with "passphrase" for first-time encryption. After encryption, any calls that interact with private keys such as sending or signing will require passphrase entry to enable these functions. See also walletpassphrase, walletlock and walletpassphrasechange. After this command runs, the wallet will shut down. encryptwallet "you should always use a long and strong passphrase"
Hidden command. Simply echo back the input arguments. This command is for testing. The difference between echo and echojson is that echojson has argument conversion enabled in the client-side table in qtum-cli and the GUI. There is no server-side difference. Here we echo the parameters used to setup a multisig address. DEPRECATED. Please use estimatesmartfee for better estimates. Estimates the approximate fee per kilobyte needed for a transaction to begin confirmation within nblocks blocks. estimatefee is deprecated and will be fully removed in v0.17. Hidden command. WARNING: This command is unstable and may disappear or change, and the results are tightly coupled to the calling parameters. Gives fee estimates for short, medium, and long term confirmations, and gives mempool statistics for transactions with those fees. Estimates the approximate fee per kilobyte needed for a transaction to begin confirmation within conf_target blocks. Estimates the approximate fee per kilobyte needed for a transaction to begin confirmation within conf_target blocks. Converts a raw hex address to a base 58 pubkeyhash address. Returns the base58 pubkeyhash address. See gethexaddress to convert a base58 pubkeyhash to a hex address. Select and add inputs to a transaction until it has enough in value to meet its out value. Collects one or more unspent transactions as inputs, and computes and specifies the change amount. Note that inputs which were signed may need to be resigned after completion since in/outputs have been added. The inputs added will not be signed, use signrawtransaction for that. Mine up to nblocks blocks immediately to an address in the wallet. Used with the regression test "regtest" private test blockchain. Can use generate 1 to publish waiting transactions in the next block, or generate 600 to initialize a new regtest blockchain. PS C:\Users\Test> docker exec myapp qcli generatetoaddress 10 "qNe5aDdubCGRaTp7vDYL4BASjzVH7c7Yc"
DEPRECATED. Returns the account name for a given address. DEPRECATED. Returns the current Qtum address for an account. Use the null account "" for the default address. getaccountaddress "My trading Acct 101"
Returns information about a contract including storage (the QRC20 balance for every address) and the code. The command may take several minutes to return, depending on the size of the storage (number of token holders). Here is the INK contract. Returns information about nodes that have been manually added using the addnode command. Get the balance in QTUM for a wallet. Returns the block hash of the most recent block. Returns information about a block. Returns information about the blockchain. Here "blocks" equals "headers", so this wallet is synced to the latest blocks. "moneysupply" gives the total QTUM created (genesis blocks + all block rewards). "size_on_disk" gives the local storage size for blocks. Returns the number of blocks in the main (longest with most difficulty) blockchain. Returns the hash of the main blockchain for the given block height (not an orphan block). Returns hex or decoded data for the header of the given block hash. Return information about all known tips in the block tree, including the main chain as well as orphaned branches. Will display chain tips since the wallet launched because only the main chain will be synced from other peers when this wallet launched. The status "active" is the mainchain, "valid-fork" are orphan blocks, and "valid headers" are not on the blockchain. Compute statistics about the total number and rate of transactions in the chain, where the default "window" is the last one month. Get the peer connection count for the wallet, typically 8 for outgoing only peer connections, or up to 125 for outgoing + incoming connections. Proof-of-stake difficulty gives the Proof of Stake consensus target from the most recent block (proof-of-work is not used after the genesis blocks). Converts a base58 pubkeyhash address to a hex address for use in smart contracts, returns the hex address. See fromhexaddress to convert a hex address to base58 pubkeyhash. Hidden command. DEPERCATED. Command line interfaces (but not the qtum-qt GUI wallet) may invoke this command using -getinfo. The wallet below has a computer clock in sync with Qtum network time (timeoffset = 0), has 8 peer connections, and is unlocked for a long time ("unlocked until" is Unix epoch time in seconds). Gives information about memory usage. If the given transaction is in the mempool, returns all its in-mempool ancestors. If the given transaction is in the mempool, returns all its in-mempool descendants. Get mempool data for a given transaction in the mempool. Gives mining information including network weight ("netstakeweight" of 12.27 million shown below) and wallet weight ("stakeweight" of 107.6). Gives the network traffic statistics since the wallet launched. DEPRECATED. Returns a network hash value related to block mining difficulty, which is not relevant to Qtum Proof of Stake, for which the network hashes per second is the total number of nodes divided by 16 seconds. Gives the parameters for IPv4, IPv6 and Tor (Onion) network connections. Gives information about the wallet peer connections. Returns a new address for receiving change with raw transactions, used for composing raw transactions. The address type may be "legacy", "p2sh-segwit" or "bech32". Get all the transactions waiting in the mempool. Get the data from a transaction, either as raw hex data or formatted (use "true"). Here formatted data is shown. The transaction above has one "vin" UTXO input which provides the previous transaction to be spent and two outputs "vout". The first output "vout" sends 300.685401 to a receiving address, the second sends 11769.78668720 QTUM to a change address. The difference in value between the inputs and outputs is the transaction fee. DEPRECATED. Returns the total amount received for an account name, which could be spent or unspent transactions, for transactions with at least minconf confirmations (default is 1 confirmation). Returns the total amount received by an address, including transactions that are spent or unspent. Get the storage used by a smart contract, may take 5 to 10 minutes to return. Here is the result for the Bodhi token contract. getaccountinfo also returns smart contract storage, plus address, balance, and code. Returns subsidy (block reward) for the specified block height. Here we see the first block which will have a block reward of 2.0 QTUM. Return details about an unspent transaction output. Has more detail than listunspent. Will return "null" if the transaction has been spent. Returns a hex-encoded proof that a transaction ID was included in a block, if there are unspent outputs in that transaction. See verifytxoutproof for the reciprocal. "immature_balance" - any coinbase (Proof of Work) balance that does not have 500 confirmations, seen only for regtest. "unlocked_until" - the Unix epoch time in seconds that the wallet is unlocked, or 0 if the wallet is locked, this field is omitted for unencrypted wallets. Gives help and examples for a specific command or lists all the commands (without a parameter). The examples are formatted so you can copy and paste them for giving the command (replacing the parameters as appropriate). Adds a 34-character Qtum address or 66 hex character public key address that can be watched as if it were in your wallet but cannot be used to spend. The wallet will rescan after entering this command and should be backed up after adding addresses. Qtum-qt returns "null" and displays the "Watch-only" balance, qtumd returns nothing. Import multiple addresses/scripts (with private or public keys, redeem script (P2SH)), rescanning the blockchain for all the new addresses in a single pass. Optional time stamps can control how far back the scanning begins for each address. Requires a new wallet backup after addition of the addresses. Adds a WIF private key to your wallet, for example as returned by dumpprivkey or from another Qtum wallet. The wallet must be unlocked and requires a new wallet backup afterwards. The wallet will rescan for a few minutes to add any balance from the new address, and return "null" if successful. Adds a public key that can be watched as if it were in your wallet but cannot be used to spend. The public key is 66 characters hex, and can be obtained using the validateaddress command. After entering this command, the wallet will rescan for a few minutes, qtum-qt returns "null" and qtumd returns nothing. The wallet should be backed up after importing a public key. Imports keys from a wallet dump file (see dumpwallet). Requires a new wallet backup after this command. Use the full path to the dump file. Qtum-qt will show a status of "Importing" for a while, then "Scanning" as it rescans the blockchain. This command may take five minutes or more to return, and the wallet may appear to freeze during this time. Hidden command. Permanently marks a block as invalid, as if it violated a consensus rule. Used for software testing or in some rare manual blockchain forking scenarios. Use reconsiderblock to reverse this command. Returns "null" if successful. Refills the key pool with new private keys, with a default size of 100. The normal size of the keypool is 1,000 and the wallet opportunistically fills the keypool as addresses are used, so this command should use a 1,100 size, etc., to be meaningful. The wallet must be unlocked. qtum-qt returns "null", qtumd returns nothing. DEPRECATED. Returns information about account names and account balances. Gives the balance in Satoshis (QTUM x 0.00000001), including the default undefined account. Lists the receiving addresses for the wallet, and their balance. Some addresses may show a zero balance. List all peer IP addresses that have been banned. Lists the address hash of the smart contracts for the wallet, and the balance of the associated tokens. Returns a list of temporarily locked (unspendable) outputs. See also the lockunspent and unlock commands. If the wallet is restarted all the locks are cleared. DEPRECATED. List the balance for the accounts. List all the transactions for your wallet since the given blockhash, or a list all the transactions since block 1 if blockhash is not given. The transactions below show a send and a receive transaction. Returns up to &apos;count&apos; most recent transactions for your wallet (default = 10), with various options. Using "account" is DEPRECATED. Returns array of unspent transaction outputs, which can be sorted by number of confirmations or for a specific address. Gives the currently loaded wallet.dat file, usually "wallet.dat" unless you can load a different file with "Restore Wallet". Updates list of temporarily unspendable outputs. Temporarily lock (unlock=false as shown below) or unlock (unlock=true) the specified transaction outputs. If no transactions are specified when unlocking then all current locked transactions are unlocked. A locked transaction output will not be chosen by automatic coin selection when spending QTUM. Locks are stored in memory only. Wallets launch with zero locked outputs and the locked output list is always cleared (by virtue of process exit) when a wallet stops or fails. Also see the listunspent call. Gets and sets the logging configuration for the debug.log file. When called without an argument, returns the list of categories with status that are currently being debug logged or not. When called with arguments, adds or removes categories from debug logging. The arguments are evaluated in order "include" then "exclude". If an item is both included and excluded, it will thus end up being excluded. The valid logging categories are: net, tor, mempool, http, bench, zmq, db, rpc, estimatefee, addrman, selectcoins, reindex, cmpctblock, rand, prune, proxy, mempoolrej, libevent, coindb, qt, leveldb, coinstake, and http-poll. Here we turn on logging for "mempool" and "mempoolrej" (they are listed first for "include") and turn off "http". Returns the current debug logging status. DEPRECATED. Move a specified amount from one account in your wallet to another. Returns "true" if the command can be parsed, whether or not the accounts exist or the movement took place. Requests that a ping be sent to other peers, to measure ping time. Results are provided in getpeerinfo, "pingtime" and "pingwait" fields are decimal seconds (does not provide a direct result like using "ping" from a system command prompt). The ping command is handled in queue with all other commands, so it measures processing backlog, not just network ping. Prioritizes a block with an earlier time for blocks at the same height. Used in hard fork situations. See also invalidateblock. qtum-qt returns "null" if successful, qtumd returns nothing if successful. Donít prune the blockchain if your wallet accepts incoming connections (over 8 peers) because your wallet needs to be able to send all the blocks to bootstrap new peers coming online. Deletes the specified transaction from the wallet. Meant for use with pruned wallets and as a companion to importprunedfunds. This will affect wallet balances. Qtum-cli returns "null". Rescan the local blockchain for wallet transactions. An optional start height and stop height can be used, or by default scan the entire blockchain. This command will scan the blockchain for transactions of your wallet, and can be used if the wallet balance doesnít appear to be correct after a wallet restore or adding private keys. Returns the start and top height scanned. Hidden command. Immediately re-broadcast unconfirmed wallet transactions to all peers. The wallet periodically re-broadcasts automatically, so this can be used for testing. Here two transactions were resent after being stuck in the local mempool after restarting the wallet. Sets the amount of coins that will not be used for staking and can be sent immediately vs. waiting 500 confirmations after staking is turned off. Returns the reserve status and amount. Writes the memory pool to disk in the mempool.dat file. Qtum-qt returns "null", qtumd has no response. Return the smart contract log events between two blocks (inclusive). The command requires -logevents to be enabled on wallet startup. Use the contract address hash if desired. DEPRECATED (use sendtoaddress). Send an amount to a Qtum address, requires the wallet to be unlocked. The "account" is for notation, it does not control the source of UTXOs. If successful, returns the transaction ID. Transmits a raw hex-encoded transaction to the network. Also see createrawtransaction and signrawtransaction. Returns the transaction hash in hex, which is the transaction ID. Sends to an address, with options for various comments and specifying the address to send the coins from. The wallet must be unlocked. If successful, returns the transaction ID. Send funds and data to a contract. DEPRECATED. Assigns and account name to the given address. Qtum-qt will return "null" if successful. setaccount "QJv3YhWxG6EC2cpqZM5E3fjGzXYgakezm" "My New Account"
Hidden command. Set the local time to given timestamp, only works for regtest. Give an epoch time in seconds, or 0 to go back to system time. The command line interface has no return. Set the transaction fee per kilobyte of the transaction message. Overwrites the paytxfee parameter seen in getwalletinfo. The default minimum fee per 1,000 bytes is 0.004 QTUM. Returns true if successful. Sign a message using the private key of an address, the wallet must be unlocked. Returns a base 64 signature hash. Use verifymessage to verify a message. Sign a message with the private key of an address, the wallet must be unlocked. Returns a base 64 signature hash. Signs a raw transaction in preparation for sending to the network. The wallet must be unlocked. See createrawtransaction and sendrawtransaction. Shuts down and exits the wallet. No return value ñ the wallet exits. Attempts to submit new block to network. See https://en.bitcoin.it/wiki/BIP_0022 for full specification. 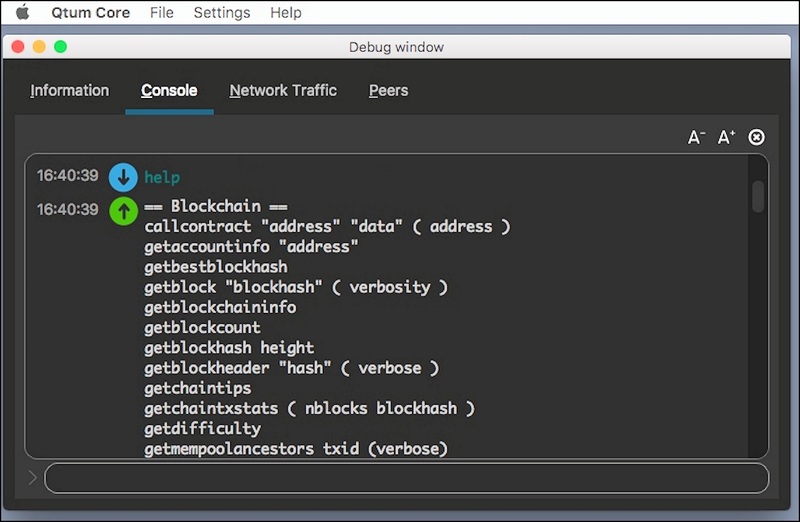 Use getblocktemplate to construct a block along with the block header and transactions. "dummy" (optional) dummy value, for compatibility with BIP22. This value is ignored. Hidden command. Waits for all the asynchronous validation queues (for the blockchain, mempool, etc.) to complete. For use by developers. Qtum-qt returns "null", qtumd returns nothing. Gives the wallet uptime (since starting) in seconds. Verifies the blockchain database for a default 6 blocks, returns true or false. Verify a signed message. Returns true or false. verifymessage "Qg3WDvb1Ey2oqAW2EpM5evdv3Ufnvre3n" "IJTWLjS9oma8M+EsXVnESR12jONwjMky4YimE0cQnvtAcQyim3lJPQ58Q6IADifR3I10LyMctNAe+2Kc274AqLu=" "hello world"
See signmessage for creating a message signature. Verifies that a proof points to a transaction in a block, returning the transaction if found or giving an empty tring or error not found in the best chain. The "proof" is the hex string from gettxoutproof. Hidden command. Waits for (at least) block height and returns the height and blockhash of the current tip (highest block). Returns the current block on timeout or exit. Timeout is given in milliseconds, 0 or default is no timeout. This command only works from the command line (not with the qtum-qt GUI wallet) and is used for development. Waits for a new logs and returns matching log entries. When the call returns, it also specifies the next block number to start waiting for new logs. By calling waitforlogs repeatedly using the returned nextBlock number, a client can receive a stream of up-to-date log entries. This call is different from the similarly named searchlogs. This call returns individual matching log entries, searchlogs returns a transaction receipt if one of the log entries of that transaction matches the filter conditions. toBlock (int | "latest", optional, default=null) The block number to stop looking for logs. If null, will wait indefinitely into the future. Hidden command. Waits for a new block and returns the blockhash and height. Returns the current block on timeout or exit. This command works on command line only (not with the qtum-qt GUI wallet) and is used for development. The timeout parameter is given in milliseconds and 0 indicates no timeout. qtum-cli returns no response, but you can check with getwalletinfo for "unlocked_until": 0 and check the padlock icon on qtum-qt. Unlock an encrypted wallet for transactions which require use of a private key, such as sending coins, staking, or exporting private keys. Timeout gives the time in seconds to unlock and the optional Boolean "true" allows unlocking for staking only. Changes the wallet passphrase from "oldpassphrase" to "newpassphrase", qtum-qt returns "null", qtumd returns nothing. walletpassphrasechange "you should always use a long and strong passphrase" "please use a strong and long passphrase"